Estádio Nacional de Brasília Mané Garrincha, also known as Estádio Nacional Mané Garrincha, Estádio Nacional de Brasília, Arena Mané Garrincha or simply Mané Garrincha, is a football stadium and multipurpose arena, located in the Brazilian capital of Brasília, DF. The stadium is one of several structures that make up the Poliesportivo Ayrton Senna Complex, which also includes the Nilson Nelson Gymnasium and Nelson Piquet International Autodrome., among others. Opened in 1974, the stadium had a total capacity of 45,200 people. After the reconstruction of 2010 – 2013, the capacity was increased to 72,788 people, making it the second-largest stadium in Brazil and one of the largest in South America. It was re-inaugurated on May 18, 2013 following renovations completed in preparation for the 2013 FIFA Confederations Cup and 2014 FIFA World Cup. The original architect was Ícaro de Castro Mello. The project was completed at a cost of US$900 million, against an original budget of US$300 million, making the stadium the second-most expensive football stadium in the world after England's Wembley Stadium. Estádio Nacional Mané Garrincha is owned by the Department of Sports, Physical Education and Recreation of Distrito Federal. The name is a homage to the football legend Mané Garrincha, who won the 1958 and 1962 World Cup with the Brazil national team. In 1974, the works on Estádio Mané Garrincha were completed. It was built when Garrincha was approximately 40 years old. The inaugural match was played on March 10 of that year, when Corinthians beat CEUB 2–1. The first goal of the stadium was scored by Corinthians' Vaguinho. On March 2, 1996 it hosted the last concert of the legendary Brazilian band Mamonas Assassinas, after it the group suffered an airplane accident which left no survivors. On December 8, 2007, the final of the first edition of the Copa do Brasil de Futebol Feminino, won by Mato Grosso do Sul/Saad, was hosted at Estádio Mané Garrincha. Brazil won the first game since the reopening of the stadium 3–0 against Japan on June 15, 2013, in the 2013 FIFA Confederations Cup. March 10, 1975: Official inauguration of the Stadium named after Governor Helium Prates da Silveira, who attended with the first football game of stadium, between the Corinthians and the CEUB, resulting in the favor of Corinthians with the score of 2–1. Decade of 1980s: The Stadium Governor Hélio Prates da Silveira is renamed to Mane Garrincha stadium. June 18, 1988: The Band Legião Urbana performs the first show of an artist on stadium, in what became to be known as one of the more troubled episodes in the career of the group. July 18, 2007: The governor, Jose Roberto Arruda, announces that the reconstruction of the stadium should be begun in 2007 and completed in 2009. The intentions are that the new stadium would become the largest stadium in America and one of the largest in the world, with approximately 100,000 seats. 18 February 2009: A public hearing reveals new information about the reconstruction of the stadium, including the prediction for the date of the beginning of works – July 2009. May 18, 2009: Governor Arruda presents the CBF changes in the design of the stadium. May 31, 2009: FIFA announces the 12 cities to host the 2014 World Cup. Brasilia appears in the list. 26 February 2010: The bidding to reconstruct the stadium is canceled by the Court of Auditors of the Federal District. 5 May 2010: IS started dismantling the Mane Garrincha stadium to give space to its reconstruction. July 7, 2010: The consortium formed by builders (Anrade Gutierrez) and Track Engineering wins the bid to reform the stadium. December 13, 2010: Works the stage follow for the step of foundations. May 15, 2011: After two unsuccessful attempts to demolish the still standing the Mane Garrincha stadium, consortium decided to continue with mechanical demolition. October 6, 2011: FIFA confirms Brasilia as host city of the opening of the Confederations Cup. February 8, 2012: With construction of the pillars running, works reach 50% completion. August 28, 2012: With 72% of the work completed, Mane Garrincha concludes the ring of pillars of the structure. September 28, 2012: 76% of work is completed after finalization of the bleachers. October 4, 2012: Secopa-DF confirms that all the chairs of the stadium will be red. October 29, 2012: The GDF, through the Secretariat of Social Communication of the Federal District, announces that the stadium is 81% completed. November 27, 2012: beside the new stages of Manaus, Curitiba and Natal, Brasilia is a candidate to receive games of state championships of Rio de Janeiro and Sao Paulo. December 11, 2012: With 84% of completed works, stage continues in the process of installing the cover. January 7, 2013: Having finalized the process of lifting cables of coverage, works reach 87% completion. 20 February 2013: starts the installation of membrane to cover the stage. March 26, 2013: The last module of the coverage of the stadium is installed. Works reach 94% completion. April 5, 2013: GDF discloses note reaffirming that the official name of the arena will not be changed to National Stadium of Brasilia because of a supposed requirement of FIFA. April 15, 2013: The inauguration of the stadium is postponed to 18 May because of delays in the installation of turf. April 27, 2013: The first rolls of grass come to the stadium. April 30, 2013: Planting the lawn of the stadium is completed. 18 May 2013: With presence of president Dilma Rousseff, in addition to the governor of Federal District Agnelo Queiroz and several other national and local authorities, the stadium is officially reopened. In the afternoon there was the opening match for the Championship final Brasiliense Candangão, between Brasilia and Brasiliense, which resulted in the victory of the Brasiliense by 3–0. 26 May 2013: As the second and last event-test before the 2013 FIFA Confederations Cup, the stadium received the opening match of the Brazilian Championship between Santos and Flamengo, which eventually resulted in a score of 0 to 0, but broke the record for the public stage and fundraising throughout the history of Brazil. June 15, 2013: The stadium received the opening of 2013 FIFA Confederations Cup, and the first game of the championship: Brazil 3 vs. 0 Japan, with goals of Neymar, Paulinho and Jô. The game broke the stadium's attendance record for the public stage: more than 67,000 fans attended. June 15, 2014: The stadium received the first game at the headquarters Brasilia of 2014 FIFA World Cup as Switzerland defeated Ecuador 2-1. The game was headed for a draw until Haris Seferović scored the latest game-winning goal in a group stage match in the tournament's history. June 19, 2014: Colombia defeated the Ivory Coast 2-1 and would qualify for its first knockout stage of a FIFA World Cup in 24 years. June 23, 2014: Brazil clinched Group A by defeating Cameroon 4-1, as Neymar scored twice in the match. 2016 Summer Olympic Games livery near Estádio Nacional Mané Garrincha. Brasília is the venue for ten men's and women's football competitions. June 26, 2014: Portugal defeated Ghana 2-1 in its group stage finale, with Cristiano Ronaldo scoring in the match to become the first Portuguese player to score at three consecutive World Cups. Unfortunately, the match was not enough to send Portugal into the knockout stages. The match was tied at 1-1, and had Ghana scored and won, Ghana would have advanced into the Round of 16 and the United States would have been eliminated at the group stage. June 26, 2014: France eliminated Nigeria in the Round of 16 by winning 2-0 to reach the quarterfinal. July 5, 2014: Argentina got an early goal from Gonzalo Higuain in the eighth minute against Belgium and it would be enough to send Argentina to its first semifinal in 24 years with a 1-0 victory. July 12, 2014: Brazil ended its World Cup campaign by losing 3-0 to Netherlands in the third place match. Goals from Robin van Persie, Daley Blind and Georginio Wijnaldum meant the Netherlands finished unbeaten at a World Cup for the first time and Brazil finished having allowed more goals at a World Cup that at any other tournament in its history. September 7, 2014: Brazil and Argentina played each other in a futsal match in which the hosts won 4-1. The attendance for that match was 56,483, a feat that more than doubled the previous high set 15 years earlier. 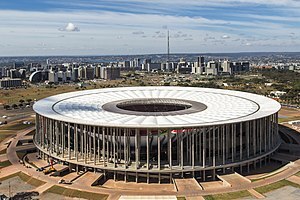 August 4–13, 2016: Ten football matches for the 2016 Summer Olympic Games were held in Brasilia's Estadio Nacional. Competitions included both men's and women's matches. Menudo: The Puerto Rican group presented at the stadium in 1985. Legião Urbana: The Brasiliense band made an official presentation at the stadium in June 1988. There were many unforeseen and confusion with the public of around 50,000 people, including home-made bombs that were thrown towards the stage, precipitating the end of the show. Hundreds of young people were hospitalized and many decided to publicly burn discs of Legião Urbana. Because of this incident, the band never performed in their hometown. A-Ha: The Norwegian group presented at the stadium in 1991. Information Society: On tour in Brazil, after the success in Rock in Rio, of 1991, the American group of synthpop presented in that same year in stage. Mamonas Assassinas: The quintet from Guarulhos held at the stage the last presentation of their career on March 2, 1996. After the show, they went to the airport and boarded the plane with prefix PT-LSD, which crashed into the Serra da Cantareira at 23:16 the same day, killing all its crew, leaving Brazil in mourning for a week. Lenny Kravitz: American singer and guitarist, presented in the stadium his first tour show in Brazil. Lenny Kravitz, who was in the tour of the disc Baptism (released 2004), played at the stage on March 19, 2005. RBD: In 2006, the Mexican band during their "RBD Tour Brazil 2006" took about 25 thousand fans to Mane Garrincha stadium. Iron Maiden: Since coming to Brazil for the first time, the first Rock in Rio in January 1985, the English band of heavy metal never presented at the Federal District. In the touring world Somewhere Back in Time, the group made the dream of fans brasilienses come true ringing for 25,000 people in the stadium on March 20, 2009, in its eighth tour in Brazil. Black Eyed Peas: In October 22, 2010, the American group landed in the city for a show in the parking lot of the stadium, as part of The E. N. D. World Tour. About 12 thousand people attended. The Pop Music Festival 2011 : The festival pop, organized by Colombian singer Shakira, brought this and also the artists Train, Chimarruts [pt], Ziggy Marley and Fatboy Slim for a show in the parking lot of the stadium, March 17, 2011 . However, because of an unusual temporal, which fell on the city, the show was rebooked for March 24, this time relying on the presence of Shakira, Train and Chimarruts. Approximately 15,000 people attended the event, at day 24. Renato Russo: The stadium hosted on June 29, 2013 the show "Renato Russo Symphonic", in tribute to the singer and leader of the rock band Urban Legion, who died in 1996. The event was a hologram of the singer in the song "For Some Time" and had the participation of other artists such as Lobão, Zelia Duncan, Luíza Worklessness, Zizi came into view Worklessness, Sandra Sá and Ivete Sangalo have been confirmed, among others. Beyoncé: The American singer made the first international show of the new National Stadium Mane Garrincha on September 17, 2013 for an audience of about 30 thousand people. The show was part of The Mrs. Carter Show World Tour. Aerosmith: The American band made a presentation at the stadium on the day October 23, 2013 as part of its world tour Global Warming Tour.About 25 thousand people were present. Circuit Banco do Brasil: The Step Brasilia festival took place in the parking lot of the stadium on December 7, 2013. At the festival there were presentations from artists such as Stevie Wonder, Jason Mraz, Ivete Sangalo have been confirmed, among others. Linkin Park: The band performed on October 19, 2014 during the Circuit Banco do Brasil. Panoramic view of the interior of the stadium after the completion of its reconstruction. The Mané Garrincha Stadium was demolished in 2010 to give way to a new stadium with a capacity of 72,788 fans and in order to reach the requirements for the 2014 World Cup, which will be held in Brazil. The stadium was renamed in early 2010 to the Estádio Nacional Mané Garrincha and the construction began in April of the same year. The reconstruction involves dismantling the lower tier and retaining the upper tier into the new rectangular bowl, and reducing the size of the playing field so that the stadium can be a football-specific stadium. The stadium will also host some games in the football tournament of the 2016 Summer Olympics to be held in Rio de Janeiro. Between the interventions planned in the Central Area of Brasilia, near the National Stadium Mane Garrincha, is the implementation of the Urban Project of Roberto Burle Marx, which provides for an improvement in landscaping between the Road Pilot Plan, and the TV tower of Brasilia through the construction of water mirrors, bike paths, sidewalks, gardens and benches. Enciclopédia do Futebol Brasileiro, Volume 2 – Lance, Rio de Janeiro: Aretê Editorial S/A, 2001. ^ "Copa do Mundo da FIFA 2014" (in Portuguese). Archived from the original on March 28, 2014. Retrieved April 16, 2014. ^ "High cost, corruption claims mar Brazil World Cup". Washington Post. May 12, 2014. Retrieved May 12, 2014. This is the second-most expensive football stadium in the world. The original budget was US$300 million. ^ "Five sad and shocking facts about World Cup corruption in Brazil". Washington Post. May 12, 2014. Retrieved May 12, 2014. ^ "Nos pênaltis, MS/Saad conquista primeiro título da competição". Gazeta Esportiva. Archived from the original on December 10, 2007. Retrieved December 10, 2007. ^ a b c "Governor confirms arena name: Estádio Nacional Mané Garrincha" (in Portuguese). copa2014.gov.br. Archived from the original on April 7, 2014. Retrieved January 27, 2012. ^ a b Daniel Cariello (June 16, 2006). /OVERBLOG/LEGIAO -urban-in-brasilia-18-years-after "Urban Legion in Brasilia: 18 years after" Check |url= value (help). ^ /resenhaeletronica/MostraMateria .asp?page= &cod= 390211 "New stadium will be ready by the end of 2009" Check |url= value (help). ^ "News on the reform of the Mane Garrincha stadium". February 18, 2009. Archived from /NOTICIAS/NOVOS -details-on-the-new-stage-mane-garrincha.html the original Check |url= value (help) on June 6, 2013. ^ "News on the reform of Mane Garrincha stadium". Portal Brasilia 2014. May 29, 2009. Archived from the original on May 19, 2013. ^ Thales Calipo (May 31, 2009). /FUTEBOL/ULTIMAS -NOTICIAS /2009/05/31/ULT59U198679.jhtm "No surprises, Fifa announces headquarters of the World Cup 2014" Check |url= value (help). ^ "Canceled bidding for reform in Mane Garrincha stadium". Portal Brasilia 2014. February 26, 2010. Archived from /NOTICIAS/CANCELADA -bid.-to-reform-on-stage-mane-garrincha.html the original Check |url= value (help) on June 6, 2013. ^ "Delayed, Brasilia launches edict of arena Cup". Portal 2014. May 5, 2010. Archived from /noticias/2804/ATRASADA BRASILIA LANKA EDICT OF ARENA OF COPA.html the original Check |url= value (help) on July 14, 2014. Retrieved September 12, 2018. ^ "Andrade and Track wins the bidding Stage of Brasilia". Portal Brasilia 2014. July 7, 2010. Archived from /PROJETOS/ANDRADE -and-via-expire-bid.-the-stage-of-brasilia.html the original Check |url= value (help) on June 6, 2013. ^ "Works of Mane Garrincha follow to step foundations". Portal 2014. December 13, 2010. Archived from /noticias/5934/OBRAS THE MANE GARRINCHA FOLLOW TO STEP OF FUNDACOES.html the original Check |url= value (help) on July 14, 2014. Retrieved September 12, 2018. ^ "After unsuccessful attempt, demolition of Mane Garrincha is without date". Portal 2014. May 17, 2011. Archived from /noticias/7059/APOS FRUSTRATED ATTEMPT DEMOLICAO THE MANE GARRINCHA IS WITHOUT DATA.html the original Check |url= value (help) on July 14, 2014. Retrieved September 12, 2018. ^ "Fifa confirms Brasilia in opening the Confederations Cup". Portal 2014. October 6, 2011. Archived from /noticias/8189/FIFA CONFIRMS BRASILIA AT THE OPENING OF THE CUP OF CONFEDERACOES.html the original Check |url= value (help) on July 14, 2014. Retrieved September 12, 2018. ^ "Brasilia stands "forest of pillars" in the stadium Cup; see pictures". Portal 2014. February 8, 2012. Archived from /noticias/9038/BRASILIA STANDS FOREST OF PILLARS IN THE STADIUM CUP SEE FOTOS.html the original Check |url= value (help) on July 14, 2014. Retrieved September 12, 2018. ^ "With 72% of the works, Mane Garrincha concludes ring of pillars of the structure". Portal 2014. August 28, 2012. Archived from /noticias/10612/COM 72 WORKS MANE GARRINCHA CONCLUDES RING OF PILLARS OF ESTRUTURA.html the original Check |url= value (help) on July 14, 2014. Retrieved September 12, 2018. ^ "After conclusion of the bleachers, stadium of Brasilia reaches 76%". Portal 2014. September 28, 2012. Archived from /noticias/10802/APOS CONCLUSION THE BLEACHERS ESTADIO DE BRASILIA REACHES 76.HTML the original Check |url= value (help) on July 14, 2014. Retrieved September 12, 2018. ^ "Secopa-DF confirms red chairs, but belies "political choice"". Portal 2014. October 4, 2012. Archived from /noticias/10840/SECOPADF CONFIRMS CHAIRS RED BUT DENIES CHOICE POLITICA.html the original Check |url= value (help) on July 14, 2014. Retrieved September 12, 2018. ^ "With 81% of the works, Mane Garrincha prepares to mount the cover". Portal 2014. October 29, 2012. Archived from /noticias/10965/COM 81 WORKS MANE GARRINCHA PREPARES TO MOUNT THE COBERTURA.html the original Check |url= value (help) on July 14, 2014. Retrieved September 12, 2018. ^ "white Elephant? Brasilia want to receive games of state of RJ and SP". Portal 2014. November 27, 2012. Archived from /noticias/11088/ELEFANTE WHITE BRASILIA EITHER RECEIVE GAMES OF STATE OF RJ AND SP.html the original Check |url= value (help) on July 14, 2014. Retrieved September 12, 2018. ^ "Mane Garrincha, 84% completed, follows the phase of lifting the cover". Portal 2014. December 11, 2012. Archived from /noticias/11172/MANE GARRINCHA 84 CONCLUDED FOLLOWS THE PHASE OF ICAMENTO OF COBERTURA.html the original Check |url= value (help) on July 14, 2014. Retrieved September 12, 2018. ^ "Budgeted at more than R$1 billion, Mane Garrincha reaches 87% of the works". Portal 2014. January 7, 2013. Archived from /noticias/11241/ORCADO IN MORE THAN R 1 BILHAO MANE GARRINCHA REACHES 87 OF OBRAS.html the original Check |url= value (help) on July 14, 2014. Retrieved September 12, 2018. ^ "Mane Garrincha starts installation of membrane coverage". Portal 2014. February 20, 2013. Archived from /noticias/11419/MANE GARRINCHA STARTS INSTALLATION OF MEMBRANE OF COBERTURA.html the original Check |url= value (help) on July 14, 2014. Retrieved September 12, 2018. ^ "Installed the last module of the coverage of Mane Garrincha". Portal 2014. March 26, 2013. Archived from /noticias/11528/INSTALADO THE LAST MODULE OF THE COVERAGE OF MANE GARRINCHA.html the original Check |url= value (help) on July 14, 2014. Retrieved September 12, 2018. ^ "Fifa would have vetoed name Mane Garrincha in Brasilia, but GDF denies". Portal 2014. April 5, 2013. Archived from /noticias/11553/FIFA WOULD HAVE VETOED NAME MANE GARRINCHA IN BRASILIA BUT GDF NEGA.html the original Check |url= value (help) on July 14, 2014. Retrieved September 12, 2018. ^ "Lawn slows and inauguration of the Mane Garrincha will be on 18 May". Portal 2014. April 15, 2013. Archived from /noticias/11598/GRAMADO SLOWS AND INAUGURACAO THE MANE GARRINCHA WILL BE ON DAY 18 MAIO.html the original Check |url= value (help) on July 14, 2014. Retrieved September 12, 2018. ^ "Mane Garrincha will pitch Wednesday, ensures government". Portal 2014. April 29, 2013. Archived from /noticias/11663/MANE GARRINCHA TERA TURF THIS WEDNESDAY ENSURES GOVERNO.html the original Check |url= value (help) on July 14, 2014. Retrieved September 12, 2018. ^ "Planting the lawn of Mane Garrincha is, finally, complete". Portal 2014. May 1, 2013. Archived from /noticias/11673/PLANTIO TURF OF MANE GARRINCHA AND LASTLY CONCLUIDO.html the original Check |url= value (help) on July 14, 2014. Retrieved September 12, 2018. ^ "Shocks, strikers and crammed stands". FIFA.com. September 10, 2014. Retrieved February 18, 2015. ^ "Informatio Society back to the city to remind their hits and show new music". Correio Braziliense. July 7, 2012. Archived from the original on April 14, 2014. Retrieved April 13, 2014. ^ SEE (March 2, 2011). /MULTIMIDIA/GALERIA -photos/mamonas-killer "Mamonas killer" Check |url= value (help). ^ /Noticias/Musica/0 "AA1285264-7085,00.html "RBD GATHERS 25 THOUSAND IN Mane Garrincha stadium, IN BRASILIA" Check |url= value (help). G1. September 25, 2006. Retrieved May 26, 2013. ^ /REVIEWS/REVIEWS -DE-SHOWS /2009/IRON -maiden-Brasilia-mane-garrincha-review/ "Iron Maiden – Brasilia – Mane Garrincha – Review" Check |url= value (help). Magazine MovinUp. March 21, 2009. Retrieved May 26, 2013. ^ Peter Brandt (October 22, 2010). "Black Eyed Peas takes 12 thousand people to parking the Mane Garrincha". ^ /CULTURA/NOTICIAS/2011/03/25/SHAKIRA -if-presents-for-15-thousand-people-in-Brasilia/ "Shakira is presented for 15 thousand people in Brasilia" Check |url= value (help). March 25, 2011. ^ "Bey faces rain and repeated performance of funkeira in DF". G1. September 18, 2013. Retrieved September 18, 2013. ^ "Worth, Brasilia!". Circuit Bank of Brazil. Archived from the original on March 10, 2014. Retrieved June 26, 2013. ^ "Worth, Brasilia!". Circuit Bank of Brazil. Archived from the original on February 15, 2016. Retrieved October 19, 2014. ^ Rio2016.org.br bid package. Archived November 12, 2010, at the Wayback Machine Volume 2. p. 23. ^ "Strengthening against the blackouts". Content Clipping MP. March 29, 2013. Archived from /CADASTROS/NOTICIAS/2013/3/29/REFORCO -against-the-apagoes the original Check |url= value (help) on March 16, 2013. Retrieved April 1, 2013.